In Europe, all petrol vehicles can run on up to 5% ethanol, and more than 90% of the vehicles produced after 2000 are compatible with E10. Cars that are incompatible with E10 are mostly classic or hobbyist vehicles or are older cars — representing a marginal percentage of the EU fleet. Flex-fuel vehicles can run on higher ethanol blends up to E85. E10 is a petrol grade containing up to 10% ethanol by volume. Since 2016, E10 has been the European test fuel for type-approval fuel consumption and emissions testing. It is currently available widely in Belgium, Finland, France (where it is the top-selling grade) and Germany, as well as sporadically in other European countries. 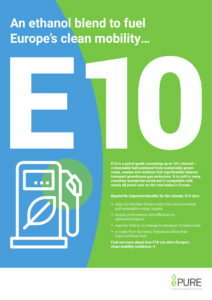 Other countries, including the U.K., Netherlands and Luxembourg, are considering adding E10 to petrol pumps. To find out more about E10, click here. Blending renewable ethanol into petrol reduces greenhouse gas emissions. The more ethanol blended in, the better the results. This will boost Europe’s ability to meet its targets for transport decarbonisation. Is my car compatible with E10? Nearly all cars built after the year 2000 are compatible with E10. There is no need to adapt vehicles to obtain instant benefits with such blends. In fact, all new cars are not only compatible with E10 but they are optimized to run on it. In the main fuel ethanol consuming markets, vehicle compatibility issues have been overcome. In the U.S., E10 has been approved for use in any conventional gasoline powered vehicle. In Europe, a list of cars compatible with E10 as of August 2018 can be found on the European Automobile Manufacturers Association website. Aren’t cars that run on ethanol less efficient? In fact, ethanol is more energy-efficient than petrol. It cools down engines twice as much as petrol when vaporised and provides more octane, which helps improve efficiency. Specifically, ethanol’s octane rating is 107, higher than that of regular petrol (95) and premium petrol (98). Additionally, it improves the resistance of the fuel to the harmful premature combustion, reduces emissions and fuel consumption in optimised engines. How does ethanol use affect emissions? Fuel ethanol blends help combat climate change as they greatly reduce CO2 emissions. But fuel ethanol can make an immediate impact in improving air quality: a recent European Commission study found that higher ethanol blends, including E20 and E85, especially help reduce emissions of Hydrocarbons (HC), Nitrogen Oxide (NOx) and particulate matter.